These are the Boots Made For Walking, and that’s just what they’ll do. While you wear these boots they give +10 movement speed to you. Once per day you can double your speed for one minute by asking the boots if they want to go for a walk or “walkies”. Upon hearing this word, the laces of the boots will excitedly start to wag. Those with the ability to commune with clothing will hear the thoughts of the boots in ALL CAPITAL LETTERS. 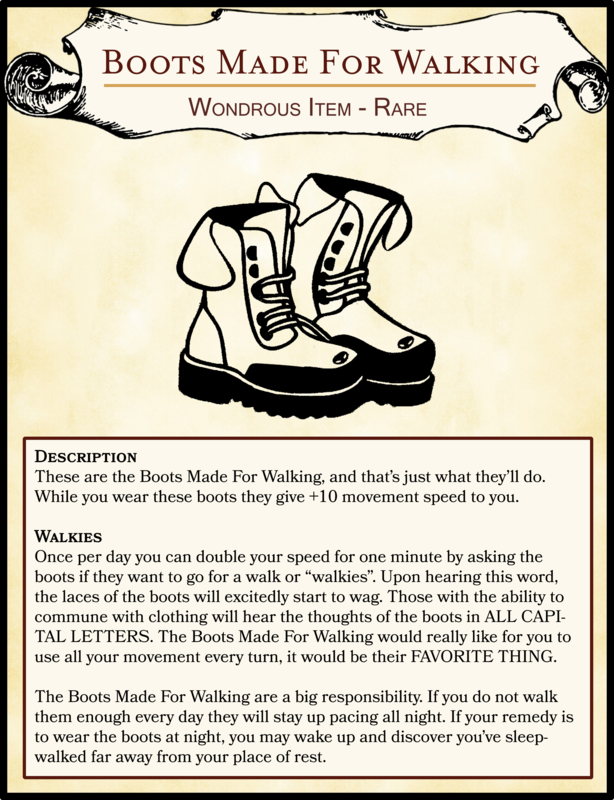 The Boots Made For Walking would really like for you to use all your movement every turn, it would be their FAVORITE THING. The Boots Made For Walking are a big responsibility. If you do not walk them enough every day they will stay up pacing all night. If your remedy is to wear the boots at night, you may wake up and discover you’ve sleepwalked far away from your place of rest.